Thanks to uber-talented designers like our lovely Vicki here, we all know the importance of making our businesses look gorgeous through our branding and how much value it brings to our business. But did you know that by introducing personal branding photography into the mix you can ramp up your reputation to an even higher level? I’m Natasha Holland (Tash) and I’ve been a professional photographer for over 10 years now. 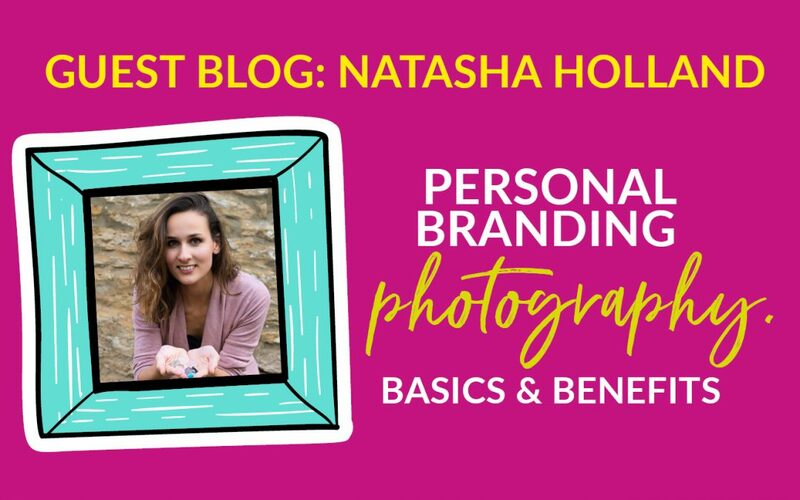 Working with women in business, and helping to sprinkle their personality all over their branding is something I’m really passionate about, so I’m thrilled Vicki’s kindly asked me to share the ins and outs of personal branding photography with you today. In a nutshell, it’s about creating well-crafted photographs which bring your brand to life, and show your audience the ‘who’ behind the brand. I’m not just talking about capturing professional headshots here but also those behind-the-scenes images (we’re all a little bit nosy, really, aren’t we? ), pictures of your team and products, and lifestyle shots taken at different locations (my favourite kind of photographs). Personal branding photography allows you, as a successful entrepreneur, to blend your professionalism with your personality – show your ‘you-ness’ if you like, without having to let potential customers into the finer details of your personal life. So, for example, you could have your photographs taken at the beach, the forest, the local coffee shop or boutique hotel. If you’re into all-things-vintage, or you love baking cakes, or you play a musical instrument, or you’re a mountain biker at weekends, you can add all kinds of props into your photographs which depict this side of your personality. And who in their right mind wouldn’t stop to look at a gorgeous cake? I don’t know anyone, that’s for sure. Think of a successful female entrepreneur you look up to – can you picture her face, her brand colours, and/or the type of locations she chooses for her photographs? Do those images make you smile and instil a strong feeling that you know her? Do you associate her with being authentic as well as an expert because she lets us peep into her life a little? Does this give you a sense of trust? All of these feelings are thanks to first-class use of personal branding photography. As well as evoking all kinds of emotions and personal reactions (which are key for any woman in business, right?) these purpose-built visuals are also a godsend when it comes to boosting your online presence. Adding the ‘personal’ to your branding imagery means you’ll never be stuck for fab and highly professional visuals for your online content, ie social media posts, website and newsletters. They allow you to tell your story, which again, is fundamental if we want to connect with our audience on a hearts-and-minds level and kickstart the relationship-building process. They stop the scrolling fingers (visuals get way more attention than text posts) from whizzing past you on social media. They speak volumes to your followers (powerful, personal branding translates as, ‘She takes her business seriously… I’d love to work with her… I want to find out the kind of things she offers’ etc, etc). And because they make you instantly recognisable (who doesn’t stop when they see Vicki’s face on her images?) they also encourage your followers to stop and take note of what you’re talking about or sharing. We all spend soooo much time online these days, that without personal branding photography, our business can easily struggle to be noticed. So if you’re interested in breathing more life into your branding, grabbing an extra few layers of kudos and bag-fulls more respect, I’d recommend booking your very own photoshoot, at your chosen location, and with a creative personal branding photographer who tailors her service to your specific needs (and makes sure you enjoy every minute of it – even if you hate having your photograph taken!). I love running my own business (can you tell?) and all the creative freedom and opportunities it brings. And I also love people – even more so if they’re into mindset, mindfulness and the law of attraction, and they know how wonderful it feels to be in alignment with their true purpose. My mission is to continue to be inspired and inspire female business owners to maximise the potential of their business by creating beautiful, branding photograph that influences, connects and impacts on their journey to huge success. The Sisterhood is definitely the future! Ever since I can remember I’ve had a camera in my hand. So there was never any doubt what my chosen career was going to be. After qualifying from Newcastle College (11 years ago) and starting-up my photography business, I invested in my own gorgeous, rustic studio in Riding Mill, Northumberland. Since then I’ve immersed myself in all kinds of photography ever since (babies, portraits, weddings, you name it, I’ve photographed it!). Having a job you’re passionate about doesn’t feel like a job at all.